Are you looking for a portable tool that can provide a quick edge? Do you want to better understand yourself and influence others? 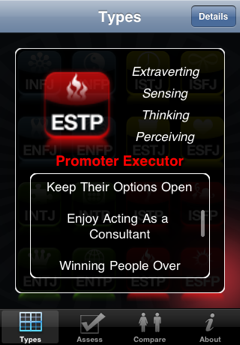 Personality Types is for use with both the iPhone™ and iPod touch®. 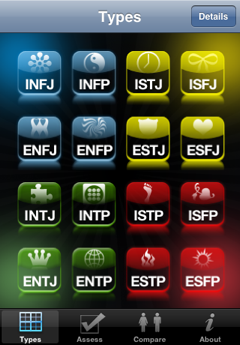 You will learn about the sixteen Myers and Briggs personality Types based on the work of Dr. Carl Jung. Feel free to browse here for a taste of the application, plus additional resources and an introduction to the theory behind the magic. Dario Nardi is a full-time lecturer at the University of California, Los Angeles, where he teaches in the Human Complex Systems degree program and the university-wide Honors Collegium. Dario received his doctorate in systems science from the State University of New York at Binghamton’s Watson School of Engineering. He has a bachelor’s degree in aerospace engineering from the University of Southern California. His background includes linguistics and creative writing. Dario’s interests and teaching include social neuroscience, artificial intelligence and robotics, personality and organizational behavior, modeling and simulation of complex systems, and undergraduate curriculum design. Methods include computer models, live group simulations and phenomenological research. The core theme is “social situated action” — understanding behavior through a “systems” lens. Since 1993, Dario has been a research faculty member at Interstrength Associates (formerly Temperament Research Institute) under the leadership of Linda V. Berens, Ph.D, an organizational consultant trained in marriage and family therapy. With Interstrength Associates, he has been intimately involved in innovative product development and research methods. His focus with personality involves developing the use of multiple complementary models to triangulate “true-self” qualities. Dario is the author or co-author of numerous books including: 8 Keys to Self-Leadership, Multiple Intelligences and Personality Type: Tools and Strategies for Developing Human Potential and Character and Personality Type: Discovering Your Uniqueness for Career and Relationship Success. He is co-author of the best-selling 16 Personality Types: Descriptions for Self-Discovery and Quick Guide to the 16 Personality Types in Organizations. Dario also authored adventure game book titles such as Secrets of Pact Magic and Villains of Pact Magic. Dario was born on January 3, 1970 in Los Angeles, where he lived until age 5. He also lived in Ojai, California. From age 5 he lived on Acra Beach in Barbados, the southern-most island of the Carribean. From 11 to 18 he lived in Bethesda, Maryland (a suburb of Washington DC) and graduated from Walt Whitman High School with honors and an all-expense paid trip to Japan sponsored by the Japan-America Society in the spirit of promoting peace and cross-cultural understanding. Dario indicates “INTJ” as the Type he most identifies with. He likes strawberries, and his favorite color is blue. Personality Types provides five key features that help you master the sixteen Types. •Quickly pull-up any of the sixteen Types for a quick summary. •Discover your likely best-fit Type (or others’ Types) using a thorough, forty-qestion assessment or a brief, eight-question assessment. •Use key words to powerfully influence others. •Delve deeper to learn the secret ins-and-outs of each Type. 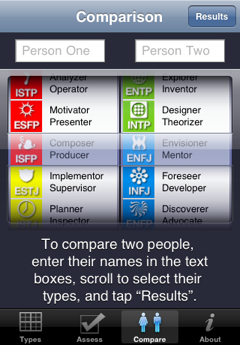 •Compare two people to locate their relationship dynamics —including areas of synergy. 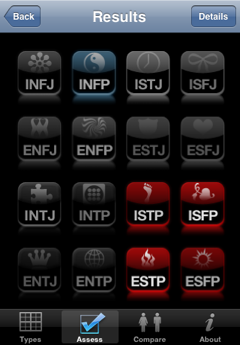 Personality Types is a lot more than just a summary of the sixteen Types; its “smart” features — the abilities to assess and compare people — allow you to get to the heart of people’s hidden strengths and weaknesses. It’s a great way to learn about Type Theory — the definitions and principles behind the sixteen personality Types.